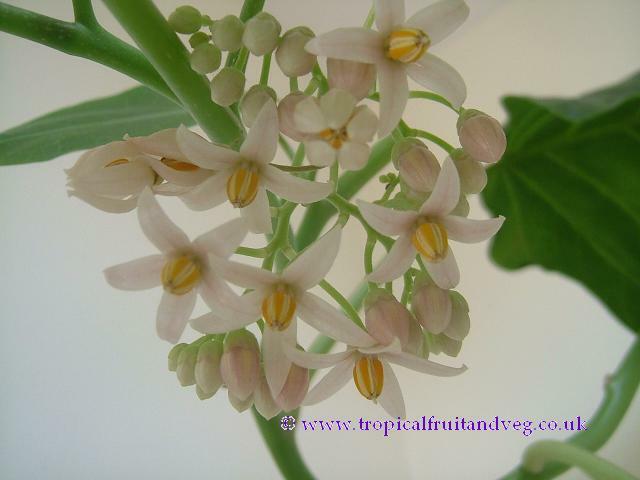 The plant is a small, half-woody, attractive, fast-growing, brittle tree; shallow-rooted; reaching 3-5 m in height. The leaves are muskily odorous, large evergreen, alternate, more or less heart-shaped at the base, ovate, pointed at the apex. Borne in small, loose clusters near the branch tips, the fragrant flowers have 5 pale-pink or lavender, pointed lobes, 5 prominent yellow stamens, and green-purple calyx. 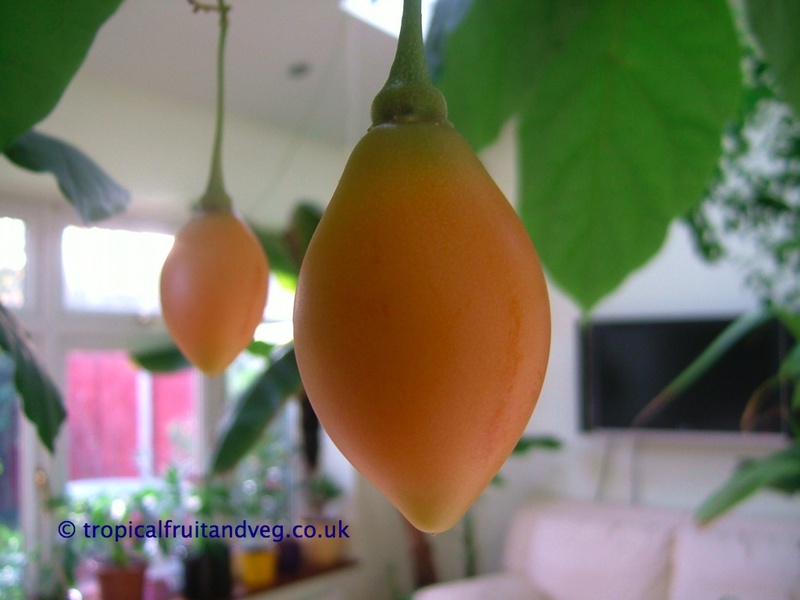 The long-stalked, pendent fruit, borne singly, or in clusters of 3 to 12, is smooth, egg-shaped but pointed at both ends and capped with the persistent conical calyx. In size it ranges from 5-10 cm long and 4-5 cm in width. Skin colour may be purple, red, orange or yellow and may have faint dark, longitudinal stripes. 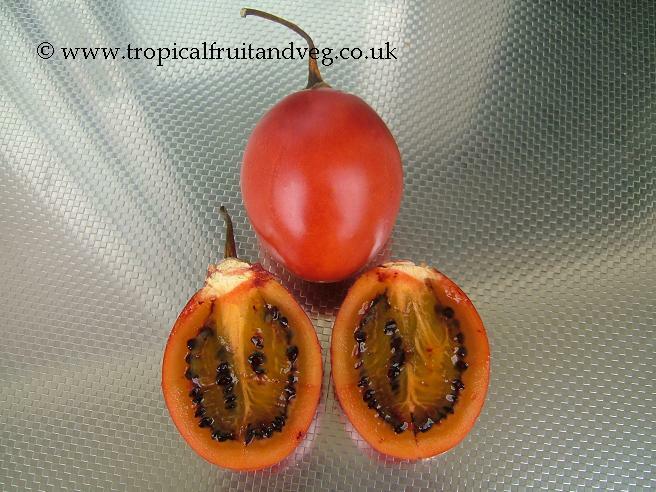 While the skin is tough and unpleasant in flavour, the outer layer of flesh is slightly firm, succulent and bland, and the pulp surrounding the seeds in the two lengthwise compartments is soft, juicy, subacid to sweet. Ripe tamarillos may be merely cut in half lengthwise, sprinkled with sugar and served for eating by scooping out the flesh and pulp. Or the halves may be seasoned and grilled or baked for service as a vegetable. The fruit should not be cut on a wooden or other permeable surface, as the juice will make an indelible stain. The peeled fruit is sliced and added to stews or soups, or served with a sprinkling of sugar and perhaps with a scoop of vanilla ice cream. Seasoned with salt and pepper, the slices can serve as sandwich-filling or may be used in salads. Chopped slices are blended with cream cheese and used as sandwich spread. In New Zealand the fruit is used to make chutneys and pickles. 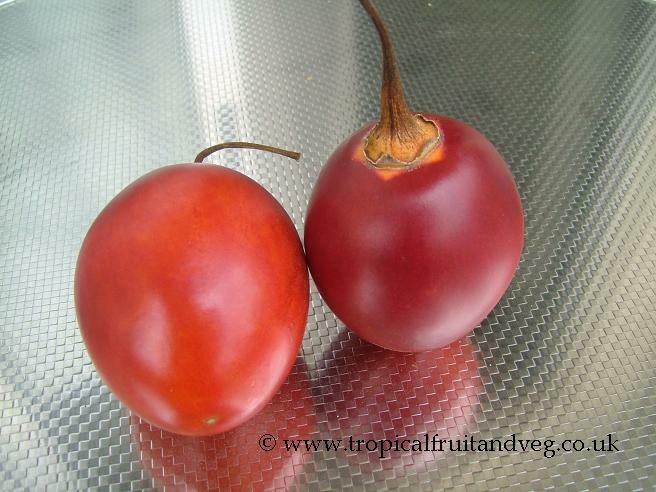 Tamarillo is subtropical. It does best where the temperature remains above 10�C. Frost at -2�C kills the small branches and foliage of mature trees but not the largest branches and main stem. The tree will recover if such frosts are not prolonged or frequent. However, seedlings and cuttings are readily killed by frost during their first year. Protection from wind is necessary as the tree is shallow-rooted and easily blown over. It is also brittle and its branches are easily broken by gusts, especially when laden with fruit. 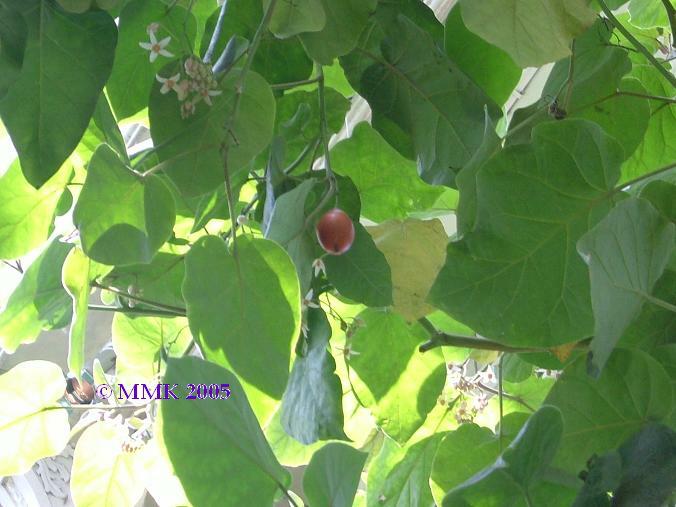 Tamarillo cannot tolerate tightly compacted soil with low oxygen content. It requires fertile, light soil. Perfect drainage is necessary. Water standing for even a few days may kill the tree. Seeds or cuttings may be used for propagation. 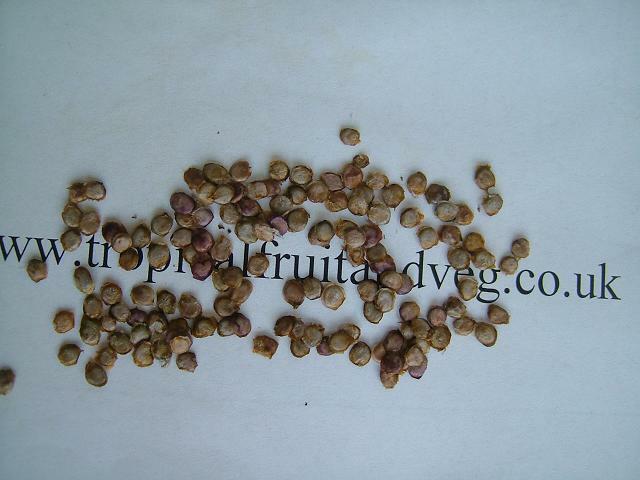 Seeds produce a high-branched, erect tree, ideal for sheltered locations. Cuttings develop into a shorter, bushy plant with low-lying branches, suitable for exposed, windy sites. The tree does not always come true from seed, but is most likely to if one is careful to take seed from red fruits with black seed pulp or yellow fruits with yellow seed pulp. The flowers are self pollinating but does better with assistance from wind or bees.